Plus £100 Returnable Damage Deposit. Check In - After 4pm on day of arrival. Check Out -Before 10am on day of departure. Advance booking is always required and full payment is payable on booking. All bookings must be accompanied by a responsible adult aged 18 years+. Please let us know in advance if you expect to arrive after the above times by phoning us on 01730 823549. Situated in the South Downs National Park, Wetherdown Lodge is right on the South Downs National Trail and is the perfect venue for active outdoor pursuits or a relaxing break. Companies looking for a venue for away-day or team-building experiences. Wetherdown Lodge was once the home of Royal Navy trainees, but it has been completely renovated and is now a model in how to use energy and cut carbon emissions. The heating and hot water is provided by a biomass boiler, which uses locally sourced wood, whilst the warmth is retained by wool fleece insulation. It has triple glazed windows, solar roof tiles and natural maromoleum flooring. ​CLICK HERE for more on the Wetherdown project. The Centre is the proud owner of a Green Tourism Business Scheme Gold Award. 14 bedrooms with 2-3 beds per room. All linen, including duvet & towels, included in price. Help-yourself breakfast of cereal, fresh fruit, toast and drinks included in price. A fully fitted, catering standard kitchen for self-catering. Communal lounge and dining area. 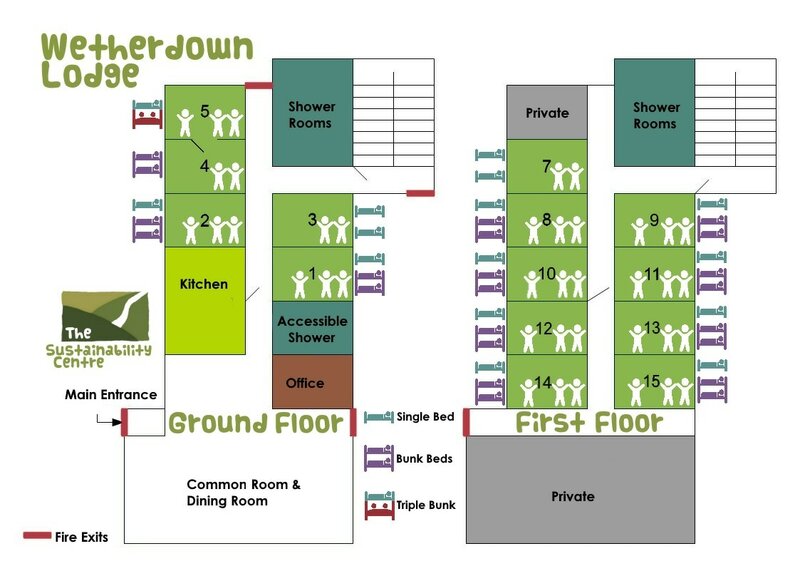 Shared showers and toilets on both floors. 55 acres of beautiful grounds and woodland to explore. Packed lunches and evening meals may be available from The Beech Cafe - Click here to order directly with them. Local takeaway food delivery menus, for those not wanting to carry food on their walk.